I’m pretty religious about applying body oil post-shower. But when a body oil promises a bit of warmth in addition to moisture, I’m intrigued (especially during this past week’s ridiculous polar vortex). 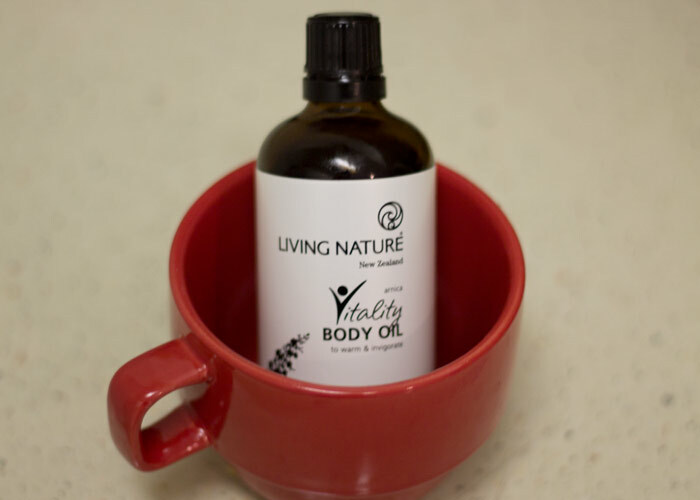 Living Nature’s Vitality Body Oil promises warmth and stimulation thanks to its star healing ingredient, arnica, and it definitely delivers. While this particular body oil doesn’t look or feel glamorous — it’s straight white and kind of thick — it gets my blood rushing, and I can feel a bit of a tingling sensation as I work it down my legs, arms and chest. The scent is subtle; it’s not overly spicy or minty; it’s quite subdued, given the ingredients. Prunus amygdalus dulcis (almond) oil, Triticum vulgare (wheat) germ oil, Arnica montana extract, Citrus medica limonum (lemon) oil, Kunzea ambigua oil, Juniperus communis (juniper) oil, organic mentha piperita (peppermint) oil, Salvia sclaria (clary sage) oil, Tocopherol (vitamin E). You’ll see the familiar carriers and essential oils responsible for invigorating the senses (lemon, peppermint, clary sage), but a new one to me is kunzea oil, which is native to Australia. It’s said to help relieve pains associated with arthritis and other muscular aches, so coupling this standout oil with arnica, which also has major pain relief properties, is a major win for those of us who have a few more aches and pains than we care to mention. I think this is an incredible oil not only for cold winter mornings, but also for post-workout showers and moisturizing. Every green beauty athlete / yogi needs this in her arsenal for those sore days! It would also make a lovely massage oil (though I haven’t had the pleasure of a massage with this just yet) thanks to the thickness but slip it offers. Do you have body oils that you reserve for after workouts or during winter? Have you tried anything from Living Nature? Tell me in the comments section!